Full transcript of the address follows:“I’m Senator Richard Burr from North Carolina, Ranking Member of the Senate Veterans' Affairs Committee and I’m honored to speak to you. “Today, all across this great nation of ours, military veterans are going about their lives with the expectation that their sacrifices will be honored and their services will be reciprocated by the government and the people they ably served. “A young Marine sergeant, just back from his third tour in Afghanistan is mulling his future career options after a VA transition seminar; a medically retired Army major, wounded in Iraq, is out on a jog with her husband, getting used to her new prosthetic leg; a Navy SEAL, old beyond his years, is having coffee with a homeless Vietnam vet he met outside the local VA clinic, and a discharged Air Force colonel, with thousands of combat flying hours, is checking his email for some word on his VA disability claim. “Thankfully, over the past five years, Congress has authorized over $600 billion to VA in robust and sustained increases of government funding for veterans’ programs designed to be part of a more responsive federal support for veterans outreach and care. “This unprecedented level of support has been especially evident in the area of veterans’ benefits, specifically disability payments. The surge in financial support has not been matched with an equivalent surge in responsiveness from the Veterans’ Administration. “The now infamous backlog of claims reached a point of national embarrassment last year when a series of biting monologues from comedian Jon Stewart finally elevated the problem to the President’s desk and spurred his VA Secretary into action. It was only then we began seeing some signs of incremental progress. “When it takes a comedian to garner a response from our government, we are in bad shape. While the backlog has begun to decline, we still have nearly 700,000 veterans and their families waiting for answers. “Today, claims are often riddled with errors, putting the burden back on veterans to file an appeal. More than a quarter million appeals are waiting to be resolved and the time it takes VA to act on appeals is worsening. As the nation’s military stands down from its war footing, veterans should not have to wage another battle here at home, this time against government bureaucracy. “We regularly hear from veterans who are experiencing unacceptable delays and waiting times for mental health counseling and other health services. These delays have real life implications for veterans, especially for those at risk of lapsing back into isolation or a downward spiral that can be difficult to stop. “After Congress heard frustrating accounts from VA whistleblowers, VA is finally taking steps to improve its staffing and responsiveness for mental health concerns and its overall delivery of health care, but more remains to be done. “Our younger veterans are entering civilian life during one of the slowest economic recoveries in our nation’s history. Some states have passed laws that issue licenses to veterans, or certifications, for the skillsets they gained while in the military, provided their training met the state’s standard. Without reforms such as these that address the problem at its root, many veterans will end up retaking classes or tests they’ve already passed while in service. “Government has a vital role to play in improving the employment prospects for veterans, but short-term, make-work programs run by government agencies are not the answer to our veterans’ long-term needs. “Lastly, I want to take a moment to speak about the problem of homelessness among veterans. In North Carolina, we’re trying something new. We’re taking private capital and motivated individuals – veterans themselves – and connecting them with government resources at HUD, in the state, and at the local level, to rehabilitate state facilities and provide homeless veterans with not only a place to stay, but a place where they can learn -- particularly the skills that allow them to enter the workforce, or get them the help they really need. “Rather than a top-down, government-centered approach, it’s citizen-centered and it’s veteran focused. I’ve introduced legislation to continue to force Washington to change, and to provide real solutions for the needs of our veterans population. “Our veterans understand these are challenging times and that the government is limited in its capacity, but they also have high expectations after the promises that have been made. The American ideals of liberty and opportunity are worth fighting for and preserving for our children. We need to harness some of that same spirit and work together on their behalf. “The answer to these problems will not be found in new offices and new employees in Washington, D.C.
“The answer lies with Congress’ responsibility to ensure that VA programs are operating in the way they were intended – and meeting the needs of the veterans, not the DC bureaucrats -- and inside the communities that our veterans live in. It’s found in the American people, among the faces that greet our returning heroes. “Working together, I know we can ensure that history will say we kept our promise. Tags: U.S. 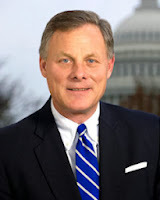 Senator, Richard Burr, Weekly Republican Address, Supporting Our Veterans, veterans, COLA cut, repeal the COLA cut, To share or post to your site, click on "Post Link". Please mention / link to the ARRA News Service. and "Like" Facebook Page - Thanks!